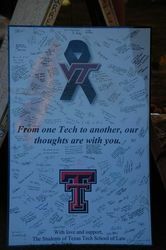 Message boards on alumni mall prior to a Virginia Tech candlelight vigil for NIU. 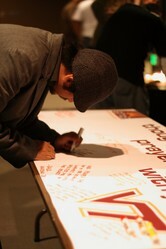 Photo taken Monday, February 18, 2008. 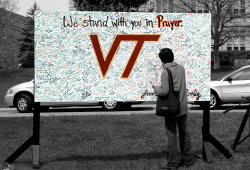 Lane Hall is visible in the far background. 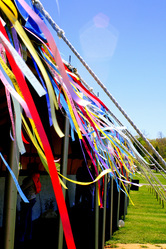 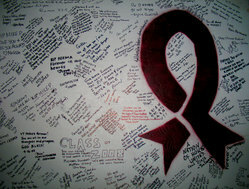 Memorial ribbons hang outside the tent that holds the signed message boards. 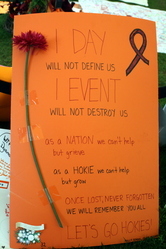 I&#39;m not sure the memorials will still be on the drill field when we get back from Missouri, so Mara and I went over to see them one last time afternoon in case the aren&#39;t there when we get back. 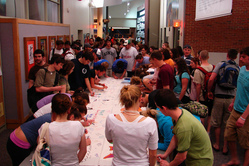 The messages boards were moved indoors after the semester ended in May. 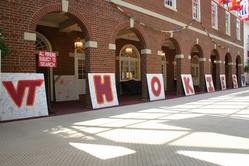 Message boards filled with comments are stationed on the drill field. 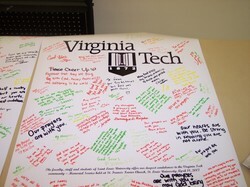 Students from the law school at Texas Tech University sent a signed message board to Virginia Tech to express their support and condolences. 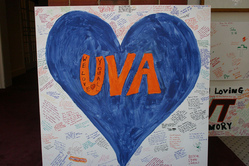 One of eight large placards sent by UVA Students in support of Virginia Tech. 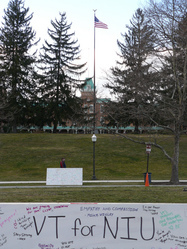 A student writes a message of support and love at message board near the main memorial site on the drill field.